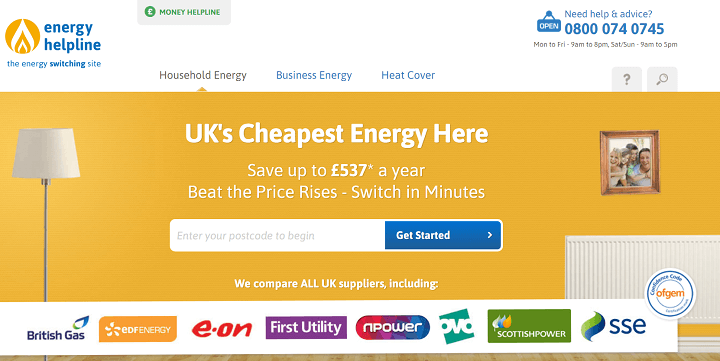 Energy Helpline Reviews: The Best Electricity & Gas Comparison Site? Energy Helpline is one of only 11 Ofgem Accredited energy price comparison sites for both domestic and business users, as well as a service to compare heat cover suppliers. Their website claims that it is possible to save as much as £537 in one year by using the switching service. Energy Helpline has a Trustpilot score of 4 out of 5 stars – making them “great”. However the first few reviews are negative as the customers say they were able to contact the energy companies direct to get better deals and that there were issues with the switching service. However some of these reviews have been noted by the website who say they will contact them. On Facebook Energy Helpline receives 4.4 stars out of 5, with 22 reviews. Some complaints include unsolicited calls and pushy sales techniques. However positives include friendly staff and easy to understand systems. One customer even won their prize draw for a Christmas hamper. The site says that they compare all UK suppliers including Scottish Power, Eon and First Utility, as well as a number of smaller suppliers. They are part of the Ofgem Confidence Code – a voluntary scheme designed to encourage fair and transparent switching services. As well as the energy switching and comparison service, the website offers plenty of information and news on the energy sector. An energy headlines section offers news stories from the industry, while the blog gives information and advice on making the most of available energy savings and general information surrounding the energy market. A series of guides to energy saving and switching is also available. Customers can also sign up wot a weekly newsletter with information on the available deals. The company describes themselves as independent and have been running for 16 years with the same management team still in place. Their customer service team is available 7 days a week and are available to help customers find their best energy company over the phone rather than using the website. Switching with Energy Helpline is easy and all that is required is a postcode and details from the customer’s latest energy bill. If no bill is available, they will ask a few questions to determine the expected energy use levels. Then the customer needs to reveal the type of tariff they would like, such as a fixed tariff or green tariffs. Then a list of possibilities is generated. All switching is done by the site including information the current supplier. The switch generally takes place within one month and without interruption to supply. Energy Helpline also encourage their customers to sign up to their Price Watch service. This allows them to inform you about the market changes and advise about the best time to switch suppliers to get the best deals. One of the main ways that Energy Helpline has connected with their customers is via the Telegraph Media Group’s Big Energy Switch campaign. This collective switching campaign allowed customers to switch to a tariff that is best for their needs using the Energy Helpline platform to find the best options. The campaign resulted in 70,000 people signing up over the Summer of 2017 and an average saving of £215 for each of those who switched. As well as keeping their customers informed on general energy news, Energy Helpline also show up as commentators on energy related stories in the media. Mark Todd is regularly quoted on stories in various media outlets including the major newspapers. He s quoted in the The Telegraph as saying that the telegraph switching service is ideal for finding the best deals. This highlights the connection between the company and the newspaper. In another article he states that energy price caps could result in price increases for energy customers. In the Guardian, the “energy expert” is quoted as saying that a merger between SSE and nPower could be a positive move for the energy market. While Energy Helpline are a big player in the energy comparison site stakes, they may not be as well known as the larger, more established sites. The reviews appear to give a good overall score and their website is simple to use, although less eye catching than some. Their ability to get their name in the public eye through commenting about news stories has worked well and their association with The Telegraph has mean they are helping many more people to switch than they might have been otherwise.